The joint operations were largely led by an alliance of the U.S. with the royals of Saudi Arabia, Qatar, UAE, Kuwait, and other friendly countries, which finance jihadists everywhere but in their own country. What’s especially interesting there, is that the vast majority of these missions were led by the U.S. and the Saud family, the royals who own Saudi Arabia, and who are the world’s largest buyers of American weaponry. 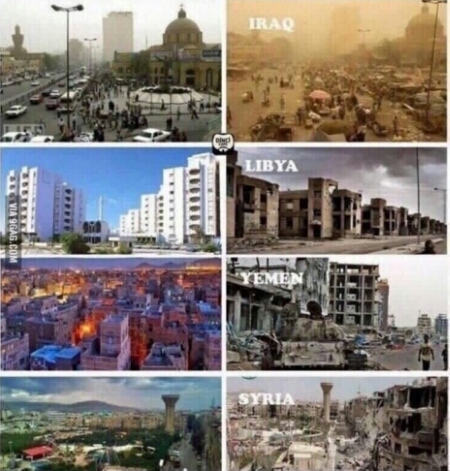 Nowadays, the Middle East is, with great difference, the most troublesome region and the source of the most significant geopolitical risk for the entire world. With overlapping civil wars in Syria and Iraq, a new flare-up of violence between Israel and the Palestinians, the Islamic State expanding and tense nuclear talks with Iran, Middle Eastern politics are more volatile than ever and longtime alliances are shifting. 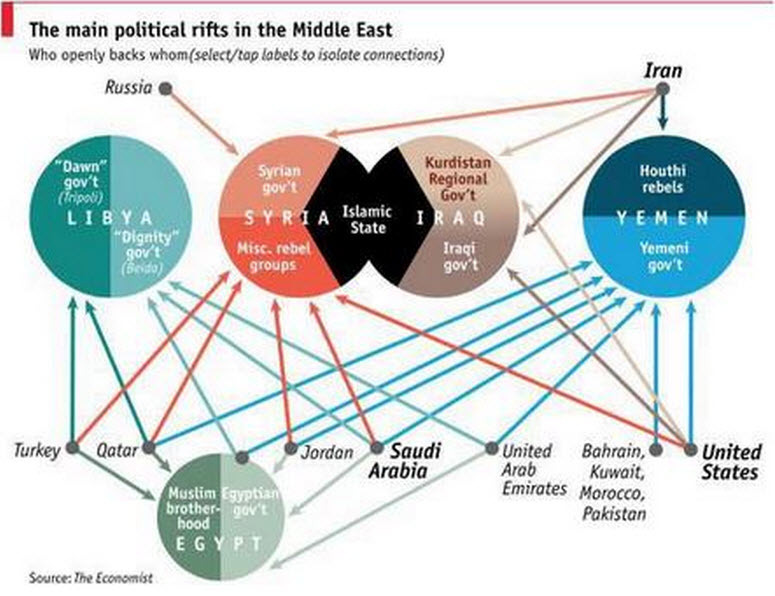 The next diagram, just published by The Economist, tries to sort friends and foes in this chaotic and increasingly beligerant region. 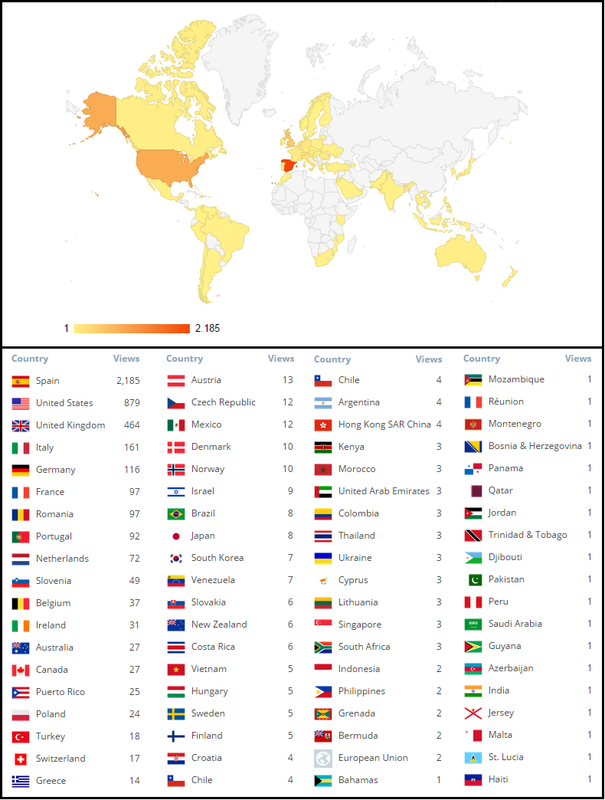 The truth of the matter is that, given the high level of complexity, the chart at the top of this post (in which Israel and Palestine were discounted for the sake of simplicity) is probably a more faithful representation of reality: beligerant chaos. 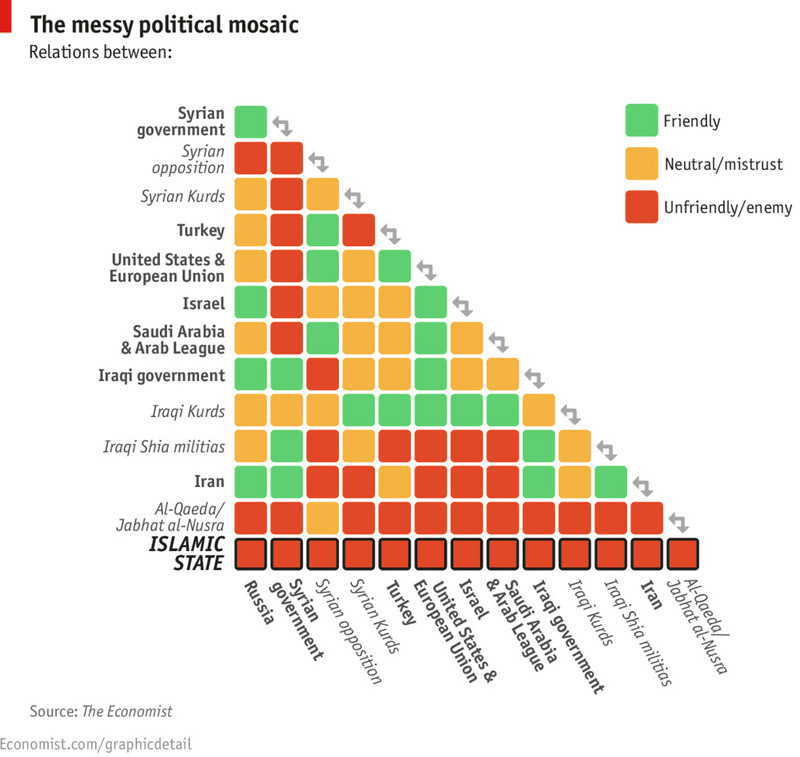 The relationship mosaic rises to insane levels of complexity if we move beyond sovreign states and include in the chart political groups and militant organizations in the Middle East. The rise of Islamic State has upended geopolitics in the Middle East and has drawn America’s military back to the region. Though ISIS is popular among militants, the group has no allies on the political stage, making it even more isolated than the official al-Qaeda affiliate, Jabhat al-Nusra. It provides a quick glimpse of who is friends with whom (albeit a simplified depiction of relationships; the “neutral” category, for instance, embraces a large number of possibilities). The Syrian government is disliked by many countries but supported by Iran and Russia. The Iraqi Kurds count numerous friends and no sworn enemies among the entities listed. 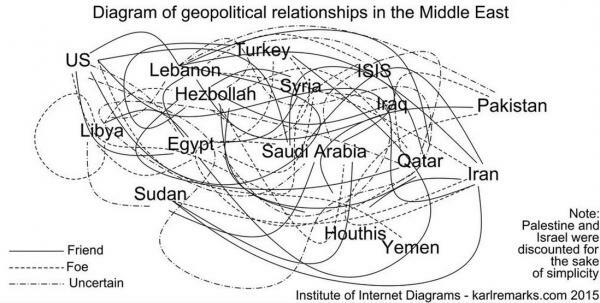 And the chart shows the degree to which America and Europe need to play a delicate diplomatic game in holding together allies that may not always be friends with each other, groups and militant organizations in the Middle East. To end on a happy note, you can watch this hilarious clip from Mounty Python’s movie Life of Bryan. Brian: Excuse me. Are you the Judean People’s Front? Reg: Bug off! ‘Judean People’s Front’. 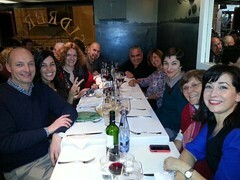 We’re the People’s Front of Judea! ‘Judean People’s Front’. 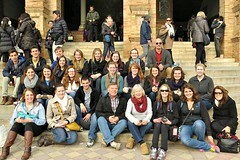 Francis: Splitters! The only people we hate more than the Romans are the Judean People’s Front and the Popular Front of Judea.